1 Chronicles 29:11Yours, O Lord, is the greatness and the power and the glory and the majesty and the splendor, for everything in heaven and earth is yours. 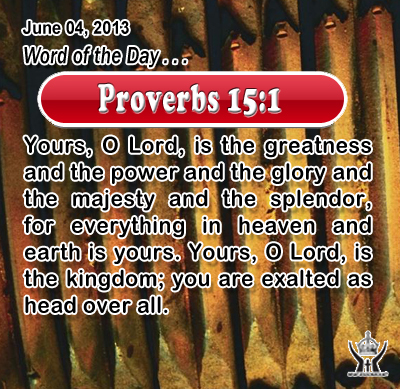 Yours, O Lord, is the kingdom; you are exalted as head over all. Heavenly Father, Great and Gracious God without compare, you are truly worthy of our best words and best thoughts and best imaginings. We celebrate what you have done, and we long for what you are yet to do. You are magnificent, our Father and our God. Through Infant Jesus, and because of his matchless love, we praise you. Amen. 13And they sent to him some of the Pharisees and some of the Hero'dians, to entrap him in his talk. 14And they came and said to him, "Teacher, we know that you are true, and care for no man; for you do not regard the position of men, but truly teach the way of God. Is it lawful to pay taxes to Caesar, or not? 15 Should we pay them, or should we not?" But knowing their hypocrisy, he said to them, "Why put me to the test? Bring me a coin, and let me look at it." 16 And they brought one. And he said to them, "Whose likeness and inscription is this?" They said to him, "Caesar's." 17 Jesus said to them, "Render to Caesar the things that are Caesar's, and to God the things that are God's." And they were amazed at him. The Jewish authorities wanted to trap Jesus in a religious-state dispute over the issue of taxes. The Jews resented their foreign rulers and reviled paying taxes to Cesar. They posed a dilemma to test Jesus to see if he would make a statement they could use beside him. If Jesus answered that it was lawful to pay taxes to a pagan ruler, then he would lose reliability with the Jewish populace who would regard him as a coward and a friend of Cesar. If he said it was not legal, then the Pharisees would have grounds to report him to the Roman authorities as a political trouble-maker and have him arrested. Jesus avoided their catch by confronting them with the image of a coin. Coinage in the ancient world had significant political power. Rulers issued coins with their own image and script on them. In a positive sense the coin was regarded as the personal property of the ruler. Where the coin was valid the ruler held political sway over the people. Since the Jews used the Roman currency, Jesus explained that what belonged to Caesar must be given to Caesar.